Every now and then I'll spot a graphic tee, read what it says, laugh and say "Yep, that's me!". This top not only did that, but it had so many other things going for it that I knew the minute I saw it that it would be going home with me. This long sleeve tee is actually Exersion exercise wear from JCPenney; but I bought it as a fashion statement because I loved the message, the long sleeves, the long length, and the thin sweatshirt material. I hate thick, bulky sweatshirts because they are not only uncomfortable, but they add a lot of unwanted pounds to my frame. This sweatshirt is a thin knit. I wore this outfit driving home from Chicago during the week of Thanksgiving. It was the perfect travel outfit. The vest was all I needed for warmth getting in and out of a car for potty breaks and meals. I bought the vest at Old Navy and last showed it to you HERE. I normally wear leggings when traveling by car, but these Kut from the Kloth Kate boyfriend jeans from Stitch Fix are so comfy that I can wear them when I travel as well. My scarf I bought last year at the Mall of America the day after Christmas. The Mall of America has the most AMAZING Day-After-Christmas sales. Last year I bought dozens of new items and I don't think I even spent a hundred dollars. I got this pink scarf and another one in white probably for around $3.00; but I don't remember what store it was. My husband and I are definitely going back this year for more deals. Now for the deal of the day: Would you believe I got this great top for only a few dollars? Yup, I did! I had a $15.00 off a $15.00 purchase from JCP. The top was on sale for $17.99, so I got it for $3.00!!!!!! I know your all sick of hearing about my JCPenney purchases, but seriously, it is the place to shop if you love clothes but need to stick to a budget. If you have a credit card with them, they send you lots of great coupons! I can't say enough about this sweatshirt. I just love, love, love it! It is totally me. I feel so good when I'm wearing something that is not only true to my style and personality, but is so comfy as well! I always wear jewelry under my scarf in case I get hot and remove the scarf. 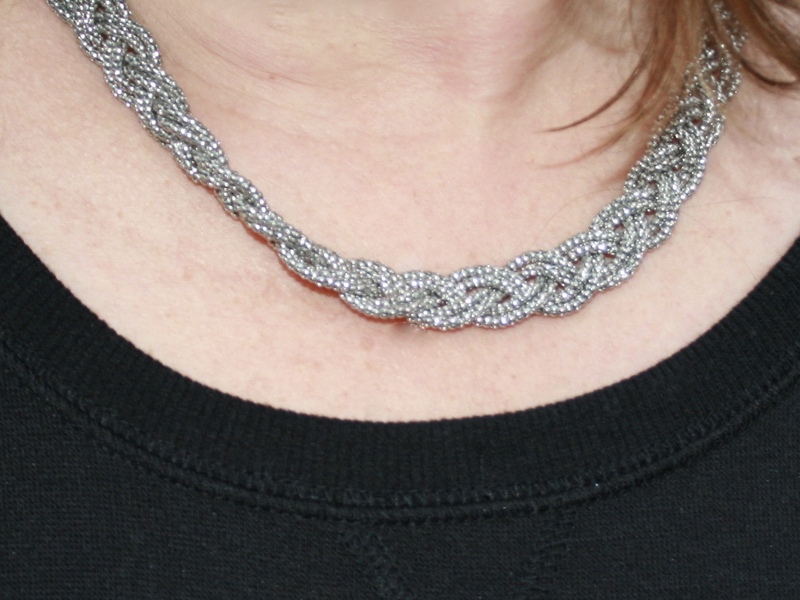 I kept the look casual by adding a silver braided necklace. And I also wore a simple silver bracelet as well. My new grey booties I showed you on Friday's Fashion Post HERE, echoed the grey graphics in the font. And yup, there's that burgundy bag again. It just goes with everything. 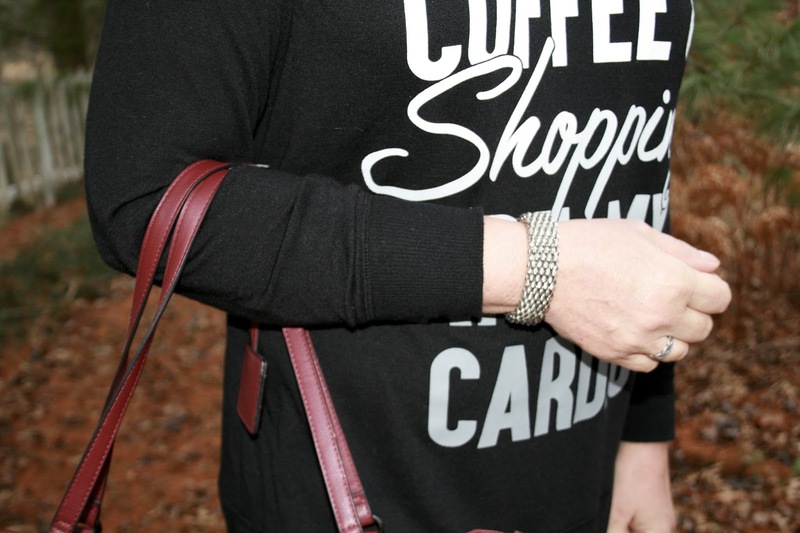 No worries, on Friday's Fashion Post I will have a new bag to show you! Textured Frost Free Vest - Old Navy: Here, Exersion Graphic Sweatshirt - JCPenny: HERE, Nicole Miller Kira Satchel (no longer available) similar: HERE, Kut from the Kloth Kate Boyfriend Jeans (no longer available) similar: HERE, and Blowfish Suba Bootie - DSW: HERE. Such a cute tee! Love the boots too! 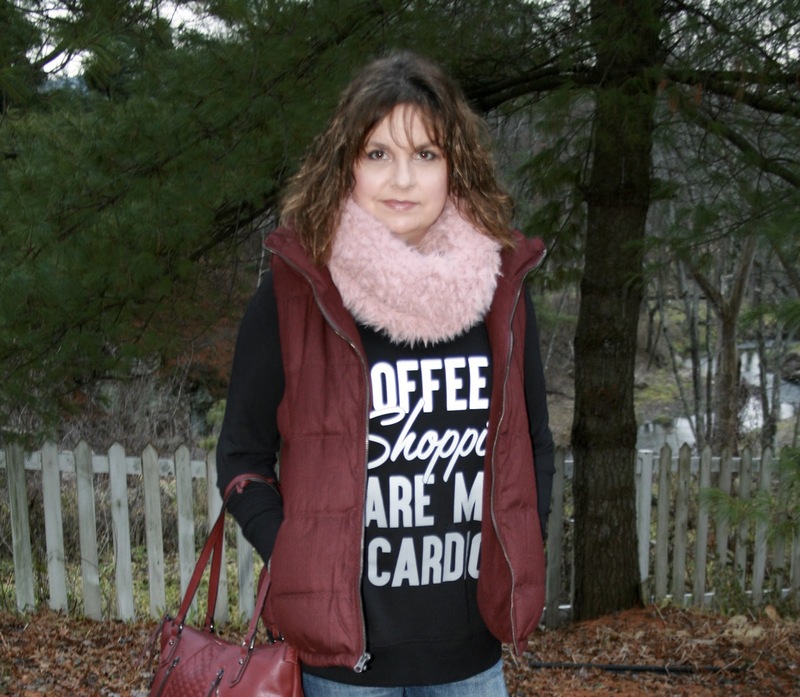 Love the tee...and the bag, and the vest, and the boots - shoot just send me the whole outfit. ;) Thank you for the boyfriend jean and graphic tee outfit inspiration! Thank you, your so sweet! Thanks Patti! Thanks for the link up! I love thin sweatshirts! Cute message! Beautiful outfit! 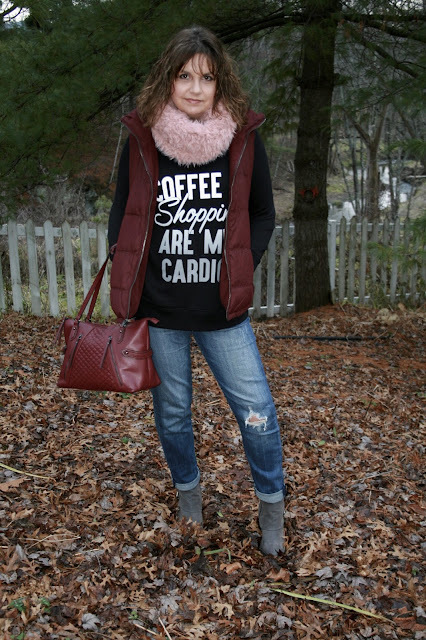 What a fun shirt, and love it paired with the vest! I'm not really trying to take a blogging break, just a break from my linky parties, but it really is getting so hard for me to get a card made. I think I only made 2 Christmas cards this year...I wanted to do photo cards, but didn't even get a chance to do those! And time is running out quickly. Thanks Elli! I just did my photo cards today, and all my Christmas Cards were done two years ago because I goofed last year and ordered the wrong size photo cards and had to remake new Christmas Cards at the last minute. Oh well, it turned out to be a blessing because I didn't have to make any this year! It's so much fun to get graphic tees! It's so cute! Gosh - another darling outfit! You are on fire girlfriend :) That is a great tee. The length and cute message are both spot on. I don't know about other readers, but I for one am NOT sick of hearing about your great bargains! I think its fun to share that sort of thing on a style blog. I mean, we all like to shop too! Thanks Karen, glad you like to hear about my bargains. I do love this sweatshirt...it's so hard to find tops with these nice long lengths. Thanks, I love the sentiment too. Although I really do exercise, but I wouldn't if I could get away with it! 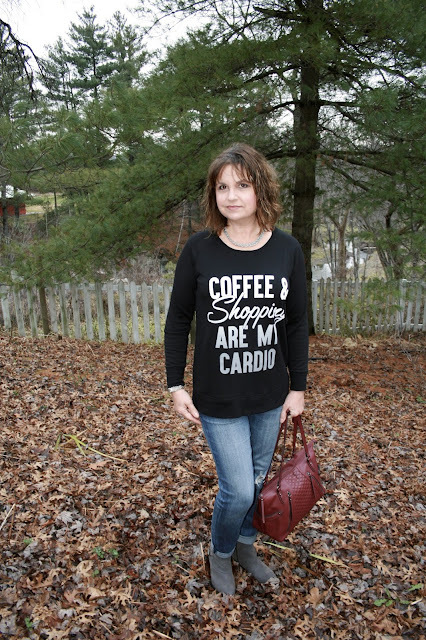 I much prefer coffee and shopping over exercising! Your graphic tee is so cute! Love this look! I always see this shirt at the mall, and wonder why I haven't gotten it yet! It's so cute every time!! Thanks Shauna, you need to get this shirt. I'd love to see how you style it. Your so creative! What a fun tee! I love how you paired it with a vest! I really love this top. If I didn't actually do cardio at the gym then I would get this top, too, lol. Thanks Cheryl, I actually do cardio too, but I hate it, that's why I love this tee. It represents my feelings about exercise. Love your graphic tee! It's super cute with that vest! Thank you, yes, I want more of these thin sweatshirts myself. They have other styles and slogans, but I didn't like them...boo-hoo! I love this outfit, Amy! The sweatshirt is so fun! I'm always on the lookout for soft, thin sweatshirts, too. Big, thick, bulky ones are so not flattering, and they are uncomfortable... I can see why you love this one so much! And I love the reds and pink with the outfit - so pretty! Finally, those boots are truly fabulous! Thanks Andrea, I really love thin, soft sweatshirts too...so hard to find though! Such a fun graphic tee! 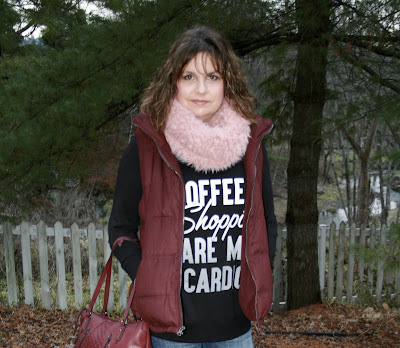 Love this cozy look, perfect for holiday shopping! You are a doll! I love this graphic T And this whole fabulous outfit!! Awww, your so sweet! Thank you! Insert smile, I need this tee as I do agree and the vest over it adds the perfect touch. You look great Amy! 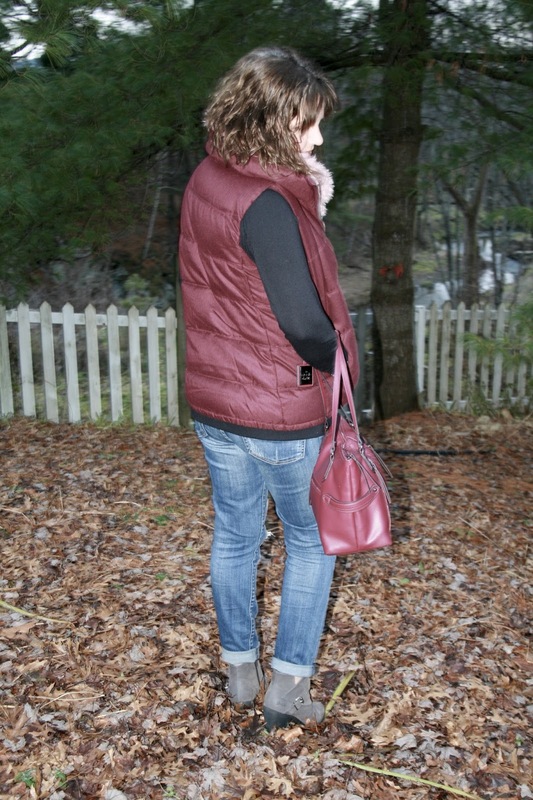 Thanks for linking up to our joined fashion and style party. Your exercise regimen is working. You look tiny and fit! LOL! Thanks, but I'm actually really struggling with that now that I finally started the wonderful world of perimenopause! I adore this look and I've got a case of shoe (or boot in this case) envy. Thank you sharing your style with my Fine-Whatever link up. Thank you! Yes, these boots have been envied by a few women ever since I posted them. Even when I tried them on in the store a woman commented on how cute they were. I guess I made the right purchase! yes, yes, yes to this graphic top!